The thick-billed green pigeon (Treron curvirostra) belongs to the family of doves and pigeons, the Columbidae. The thick-billed green pigeon species is distributed in India, Nepal, Bhutan, Bangladesh, southeast Asia and China. These pigeon species have thick pale yellowish green bill with red base. These pigeons are monotypic species. The thick-billed green pigeon (Treron curvirostra) is a small-sized green pigeon, measuring 25 to 30 cm in length and weighing 110 to 190 grams. The overall plumage of these thick-billed green pigeon species is green. The forehead and crown are bluish gray. The mantle is maroon. The face, neck, throat, rump and underparts are light green. The primaries and secondaries are black with yellow outer edge. The undertail coverts are chestnut in males. The bill is thickset and is pale greenish yellow with red base. The irises are blackish. There is a broad bluish green eye ring of bare skin. The legs and feet are red. The call of these green pigeon species is a soft, drawn-out, melodious, whistling sound. These thick-billed green pigeons are distributed in India, Nepal, Bhutan, Bangladesh, Myanmar, Thailand, Cambodia, Laos, Vietnam, Malaysia, Singapore, Brunei, Indonesia, Philippines and China. In India, these thick-billed green pigeons are distributed in the states of Odisha, West Bengal, Sikkim, Assam, Meghalaya, Arunachal Pradesh, Nagaland, Manipur, Tripura and Mizoram. In China, they are distributed in the provinces of Yunnan, Guangxi and Hainan. 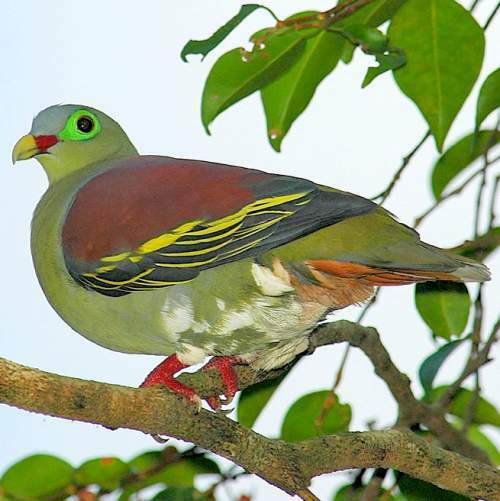 These thick-billed green pigeon species have moderate forest dependence. They normally occur in altitudes from 0 to 1500 meters. The artificial ecosystems and habitats of these species include heavily degraded tropical and subtropical forests and plantations. 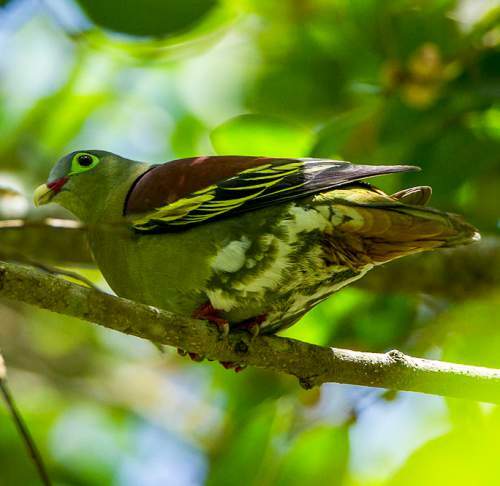 The natural ecosystems and habitats of these thick-billed green pigeon species include, tropical and subtropical moist lowland forests, foothill forests, evergreen and semi-evergreen forests, mixed moist-deciduous forests and mangrove forests. The diet of this thick-billed green pigeon consists mainly of figs. Wild fruits, berries, drupes, figs and syconia of figs are their primary food. These species are mostly arboreal, feeding on fruits from shrub layer, lower branches as well as the canopy. The breeding season of these thick-billed green pigeon species is from March to August in India. The laying season is during January and February in Malaysia. These species are monogamous and territorial. 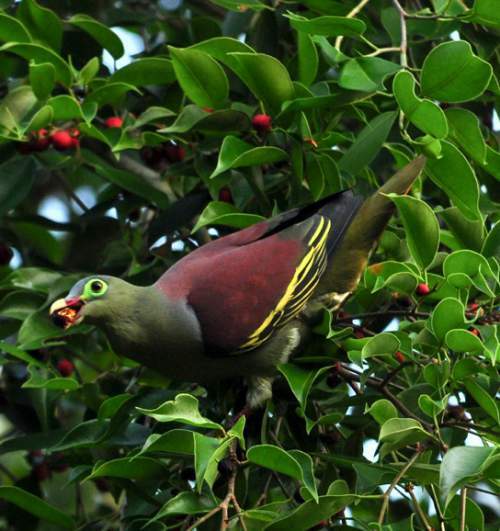 The nesting sites of these stout billed green pigeon species include shrubs, bamboo thickets and forks of tree branches. The nest is a flimsy platform of sticks and twigs. The typical clutch contains two white eggs. The chicks of the thick-billed green pigeon are altricial and require considerable parental care. Initially the chicks are fed by parents with crop milk, a regurgitated secretion from the lining of the crop. These thick-billed green pigeon species are non-migrant resident birds. They disperse locally after breeding. The populations in higher altitudes descend to the lower levels during winter. Post breeding, the juvenile thick-billed green pigeons may disperse and establish in new locations within the range. Within their range they may make local movements for feeding and breeding. The global population size of the thick-billed green pigeon (Treron curvirostra) has not been quantified. The overall population trend of the species is considered to be stable. In most of its range, this species is reported to be common to abundant. The generation length is 4.2 years. Its distribution size is about 9,970,000 sq.km. Habitat alteration and destruction and capture of adults and juveniles for pet-trade are the main threats that are endangering the survival of these green pigeon species. The thick-billed green pigeon (Treron curvirostra) does not approach the thresholds for being Vulnerable, either under the range size criterion, or under the population trend criterion or under the population size criterion. The IUCN (International Union for Conservation of Nature) has categorized and evaluated the green pigeon species and has listed it as of "Least Concern". The CITES (Convention on International Trade in Endangered Species of Wild Fauna and Flora) status is ‘Not Evaluated’ for the thick-billed green pigeon (Treron curvirostra). The thick-billed green pigeon (Treron curvirostra) are closely related to the grey-cheeked green pigeon (Treron griseicauda), Sumba green pigeon (Treron teysmannii), Flores green pigeon (Treron floris) and Timor green pigeon (Treron psittaceus). Current topic in Birds of India: Thick-billed green pigeon - Treron curvirostra.